I work at Vanguard Printing in Ithaca through a temp agency. I make $9.70/hour. On average, I work around 70 hours per week. Last week I worked 73 hours. I was released from prison earlier this year. I take as many hours as I can so that I can pay off fines and court fees and save enough to move out of where I’m living now. I have a room in Groton that’s paid for by DSS. I share a kitchen and a bathroom with five other men. I’m a pragmatic thinker, but I constantly feel frustrated with my housing situation. Housing is only as good as you can make it with other people. I don’t get to choose who I live with, and the guys don’t clean up after themselves. The place is infested with roaches and all types of bugs. I rely on the bus. It takes me two hours to get to work, and two hours to get back. I get on a bus that takes me to downtown Ithaca and then wait to catch another bus that will take me back out. I fall asleep on the bus all the time. 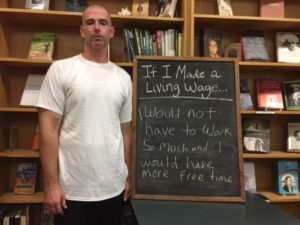 I think that a living wage would help some people to stay out of prison. When I was in prison, I felt like I was self-sufficient. I didn’t have to ask people for things all the time. When you come home and you can’t earn enough to take care of your own needs, it’s hard on your self-esteem—especially when you’re younger. You feel like you’re a little kid again. At that point, you need to be able to feel like a man. And it’s important for people to see progress in themselves—you need to actually be valued at work, you need to be able to save, you need time to better yourself. I would have liked to enroll in a pre-college program, but I didn’t have time. Low wages stagnate people who are trying to rehabilitate their lives. I don’t believe that handing things to people works, but I do believe that people need opportunities. I think that a fair economy would mean a minimum wage that keeps up with the cost of living. I also think that transparency in hiring is really important. If I made a living wage, I would be able to pay off fines. I would be able to move out of this place where I’m living now. I would sit down in my own space and be comfortable instead of cleaning up behind everybody else. I would be left alone sometimes and that would be great for me. I like my space. I’ve been surrounded by people forever. Something doesn’t add up here… 70 hours a week at $9.70 is $35,000+ a year, and he gets his housing subsidized, hopefully has no children, and takes the bus. How is that not enough to support himself? No one should have to work that many hours, but in Upstate New York, one should even be able to get by in his situation with even less. Read a book on the bus, Trevor, if you want more free time.